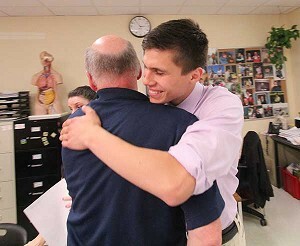 Dr. Mike Grady hugs his translator Jorge Bañuelos after the 18-year-old gave a school presentation about the pair’s medical mission trip to Guatemala. 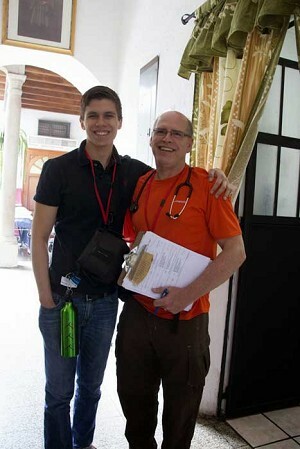 Jorge Bañuelos translated for Dr. Mike Grady on medical mission trip in Guatemala. PHILOMATH — About to graduate from Philomath High School, Jorge Bañuelos found his calling on a mission trip to Guatemala. Son of immigrants from Mexico, Bañuelos served this spring as translator for an Oregon doctor in the poverty-stricken Central American nation. Guatemalans walked miles overnight to be seen, even when suffering from hernias, cataracts, gall bladder disease and other infections. “I went there because I really wanted to help these people,” he says, recalling row upon row of hopeful patients in wheelchairs. The 18-year-old member of St. Mary Parish in Corvallis will attend Oregon State University to study biochemistry. He’d like to enter medicine in some way. Right now, he imagines becoming an assistant for a surgeon. His mentors tell him he could be the surgeon himself. The trip was the centerpiece of a senior year project. Most kids got a budget from parents. But Bañuelos, student body president at Philomath, raised money for his trip by placing donation jars at a half dozen local businesses and organizing a benefit dance. His parish also kicked in a large contribution. An altar boy, musician and a member of the LifeTeen youth group at St. Mary’s, Bañuelos translated for Dr. Michael Grady, a member of St. Paul Parish in Silverton. This was Dr. Grady’s third trek to Guatemala on a medical mission organized by Faith in Practice, a non-denominational group based in Houston. For eight or nine days, doctors rise at dawn to pray and then go on the road to villages to do primary care. Others, like Dr. Grady this year, stay in Antigua to perform surgery at the church-run hospital. Physicians see 40 to 50 patients per day, as opposed to 15 or 20 per day at U.S. medical offices. Bañuelos was there the whole time. Bañuelos watched surgeries for hours on end, helped prepare patients and handled paperwork. The Guatemalans were thrilled that the American could speak Spanish. That smoothed the process. Bañuelos, with a natural sunny disposition, tended to brighten the day for sick people and their children. He spent an afternoon playing soccer with youngsters at a Catholic orphanage. Photos show children flocking around him. One teacher on the panel evaluating Bañuelos’ talk wept as he discussed his work. Among the patients he comforted was a woman whose cervix had to be removed. She was bereft that she would not have children, but glad her health would improve. Bañuelos could have shadowed a doctor close to home, but decided on a trip to another hemisphere. “I wanted to take a unique path, out of my comfort zone,” he says. It was his first trip without his parents. His mother, a kindergarten teacher in Corvallis, hugged the young man tightly after he finished his talk.